Jim Jagger’s application for a pardon sailed swiftly: He filed in late October, got a hearing in December and won Snyder’s blessing before Christmas, despite opposition from the Oakland County prosecutor, who vigorously claimed it was “special treatment” for a “career drunk driver,” according to records obtained by The Associated Press. A pardon is an extraordinary tool in the state constitution that makes a conviction disappear. During Snyder’s eight years as governor, people filed more than 4,000 applications for a pardon or commutation, which shortens a prison sentence. He granted fewer than 100. It’s not publicly known why the governor or his aides were so interested in helping Jagger, who makes $144,000 a year as a vice president at the CPA group. But with Snyder’s term nearing an end, his staff put the case “at the top of the stack and said, ‘Process this one,'” said Chris Gautz, a spokesman at the Corrections Department, where pardon files are screened. He and his lawyer, Bill Urich, didn’t respond to AP’s multiple requests for an interview. Nor did Peggy Dzierzawski, the current president of the CPA group. 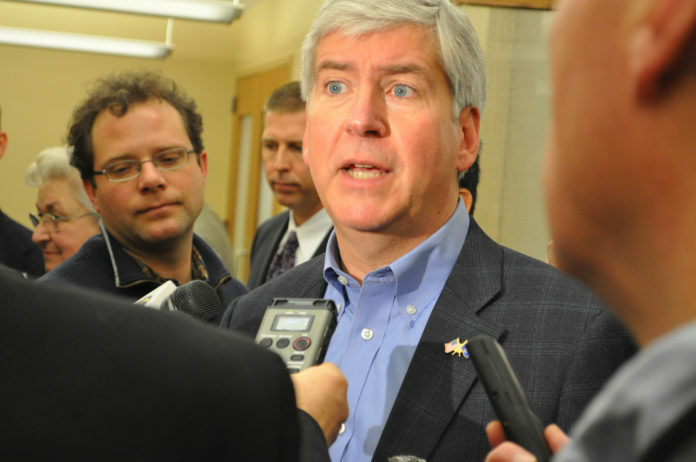 Snyder, who is a CPA, left office on Jan. 1. An aide, Allison Scott, said he was away and unavailable to answer questions. Jagger’s desire for a pardon is detailed in documents obtained by the AP under a public records request. He explained it during a Dec. 12 hearing with the Michigan parole board, which makes recommendations to the governor and voted in Jagger’s favor. Since 2016, he has been senior vice president and chief marketing officer at the Michigan CPA organization. The Troy-based group serves 18,000-plus members by offering career workshops, monitoring industry trends and influencing laws and accounting rules in Lansing. Jagger said he’s a “leading candidate” to succeed Dzierzawski as president in 2019 but that a felony conviction on his record would put him “down on the ladder” and probably spoil his chances with the board of directors, according to a transcript. He said Dzierzawski was the only person at work who knew about his past. “I have a limited window of earning potential left, and I’m trying to maximize that. … But even if it’s not that opportunity, there will be other opportunities or I could actively pursue a job,” Jagger said of the benefits of a pardon. He said he hasn’t had a drink since the 2007 arrest. Gautz of the Corrections Department said the board was “never pressured” by Snyder’s office about what to recommend. “The board’s vote doesn’t matter because the governor can pardon anyone he wishes,” Gautz said. It wasn’t the first time that Snyder, a Republican, had used his power to clear a drunken driver. In 2014, he pardoned Alan Gocha , a $250,000-a-year lawyer with political connections to Republicans. Gocha said the misdemeanor was making it harder to work and to travel outside the U.S. Separately, the attorney general’s office also objected. “I’m sure they would all like to petition and be excused,” she said. “I’m a prosecutor. We have strong opinions because we see the devastation, the families destroyed, the people who might never walk again” because of drunken driving.